I almost backed out of writing a review of Howl’s Moving Castle because I really wasn’t sure what to say. While it’s a charming little story, there’s the unfortunate problem of all the magic used. A few witches are mentioned, and one of the main characters is a wizard. There’s also a fire-demon, who under Howl’s orders is the one responsible for the way the castle sits in four different places at once. <!-more-->The movie was first recommended to me a year or two ago, and later I saw a book review on a blog I follow. The story sounded wonderful, but I wasn’t sure how deeply the magic elements were involved. I finally decided to give it a try. The story was great. Theological issues aside, it was a fun plot with lovable characters. A young adult named Sophie is sure she will never be able to seek her fortune, because she is the eldest. After the Witch of the Waste curses her, making her an old woman, she sets out to seek her fortune anyways. She decides to go to the Wizard Howl to get rid of the curse placed on her, and meets his assistant Michael and the fire-demon Calcifer. 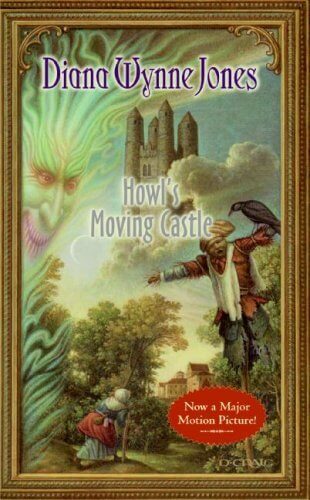 Both the castle and Howl have more than a few secrets, which she finds as she stays with them. I’m almost sad that Howl’s Moving Castle is so well written, because it might make it easier to dislike. The only problem I had with it was the witches and wizards. There’s the argument that a lot of fairy tales have a witch in them, but then again the witch in those stories obviously isn’t a good guy. Howl doesn’t really fit in there. There are even Christian stories with witches and wizards, such as The Lord of the Rings, and The Chronicles of Narnia. Again that doesn’t work, because the White Witch is definitely evil, and Gandalf isn’t actually a wizard. A lot of people could argue that “You’re reading Harry Potter. What’s the difference?”, and that’s the argument that I had the most trouble with. However, while Harry and the other wizards are born wizards, Howl and the witches in this story are trying to learn –and have learned—witchcraft. In short, Harry Potter doesn’t really come across as evil to me any more than Elves or Gandalf do. While they do practice magic, it’s because that is a talent given to their race, like the “magic” that Gandalf does. In Howl’s Moving Castle, anybody can learn magic. The people aren’t a different race. I don’t have a single argument for Calcifer though. He’s a good character like the rest, but he’s still a fire-demon. Whatever the author meant by that, the fact that Howl has made an agreement with anything called a “demon” cannot be good. After I considered it, I think it’s best not to recommend this book. While I will tell anyone who asks that I enjoyed the story, it also revolves around more magic than I feel I should recommend. There isn’t a bunch of spells or explanations the magic, but between the titles of other books by the same author listed in the front cover, and the simple fact that witchcraft is wrong, I am reminded of the thought that bad things are always more successful when they are subtle. Thankyou for this review, Ashley. I’ve heard much about this book, have picked it up and looked at it in the library, but have never been sure of the ravings about it, and thus was never sure whether to read it or not. Thanks for the review, I watched the movie, but I didn’t like the book much…. But about the magic/Harry Potter thing, while I haven’t read both books, I was under the impression that Hogwarts was to develop their talens, which is in a way, learning magic. But I think in the movie(and also the book? ), magic was also an innate talent that is developed, like Sophie’s skill…. So both books would be similar? But then again, I’m not too sure about it. As an aspiring christian fantasy writer I will say this. While I will admit that Howl’s Moving Castle diffinetly doesn’t have christian themes a person must remember that not all people have a positive view of Christianity. Which is why many authors who do believe in God such as Tolkien, Lewis, and hopefully myself use magic in stories to reach out to those who don’t believe. So they will pick up on certain themes in the story and hopefully think about what they have come to believe. Whoops… I should check for comments more often. Eustacia: That may very well be a good point. I’m miserable with words, though; I’m having a bit of trouble explaining how I interpreted both books.